Jason Furman has an interesting piece on Vox today, claiming that the “puzzle” of weak wage growth in the face of low unemployment is not really a puzzle at all. Productivity does a good job of explaining the evolution of average wage growth in the United States as well, especially prior to 2000. (But it does a decent job even since then, even with the wage slowdown.) From the end of World War II until around 2000 average wages grew almost lock-step with productivity — if you use the same measure of inflation for both concepts, so the comparison is apples to apples. 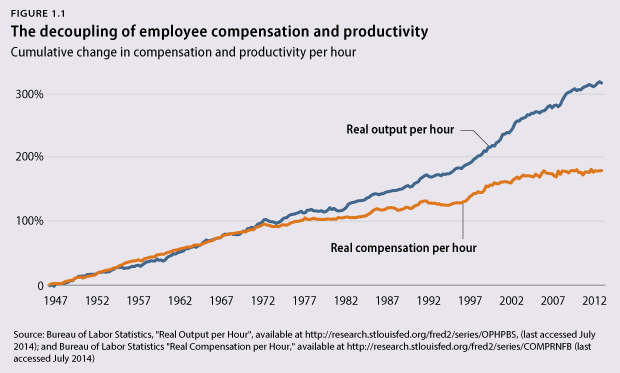 Often, presentations of the comparison between wages and productivity, as in this much-reproduced graphic, use a higher inflation measure to adjust wages than productivity and thus produce a misleading impression. This is a criticism we’ve seen, and addressed, before, so forgive me if I seem a tad sensitive on this, but I want to be really clear: there is nothing misleading about our presentation of this data. The wedge we show between our measure of pay and economy-wide productivity is indeed driven overwhelmingly by rising inequality and not the differing deflators. In this figure we measure the pay of typical workers, not average wages. We define “typical” as either the median worker (the one in the middle of the wage distribution) or the average pay of production and non-supervisory workers (a group consisting of about 80 percent of the private-sector workforce). We don’t use average pay precisely because, as Jason notes, average pay kept up pretty well with economy-wide productivity pre-2000. This means that the bulk of the rise in inequality over that time was driven by inequality within wages, or the divergence between average and typical pay (as we clearly show—see the previous link). 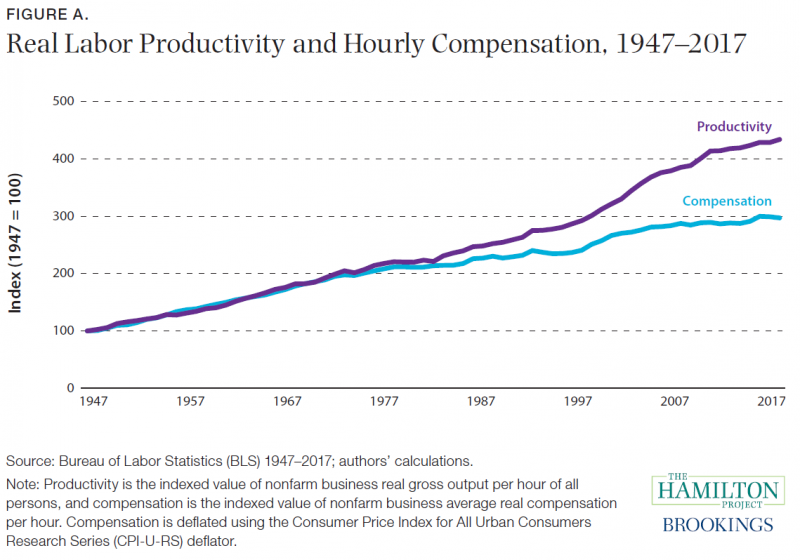 So, if Jason wants to claim that average pay and productivity tracked better since 1979 than one might imagine if they were looking at our graph and thinking it showed average pay and productivity, this isn’t because we’re being misleading with deflators, it’s because they’re misunderstanding what is clearly labeled on our graph. Again, we’re not showing average pay, because average pay obscures the primary way inequality rose in recent decades (or not-so-recent now) decades—the typical workers’ pay falling further behind measures of average pay pulled up by stratospheric growth at the top. 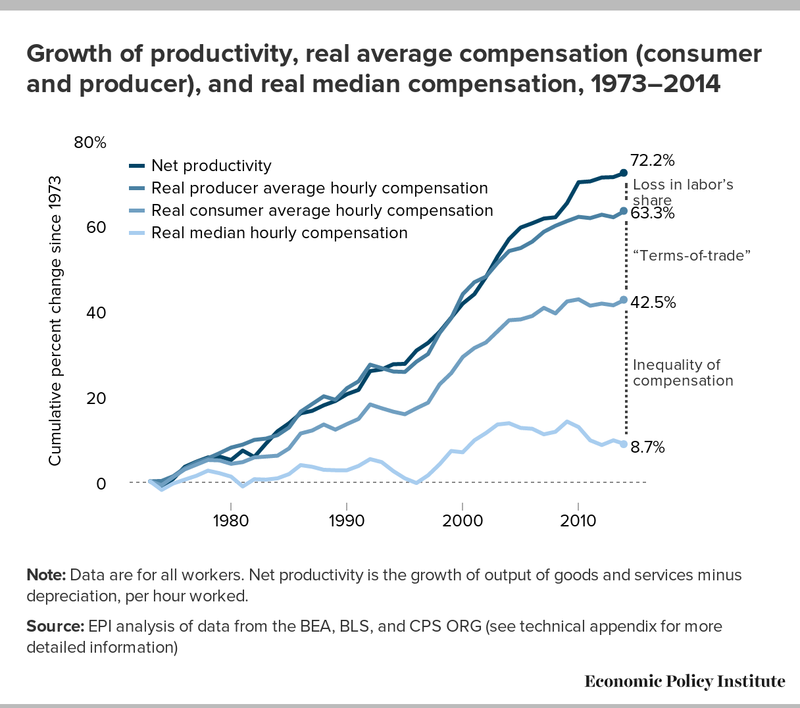 Now, there are graphs out there that seem to have been inspired by EPI’s that do show a divergence of average pay and productivity, and that wedge is indeed nearly-entirely driven by differing deflators (the remainder is a shift from labor to capital-based incomes). That’s a problem in these presentations, but, that’s why we don’t do it that way! 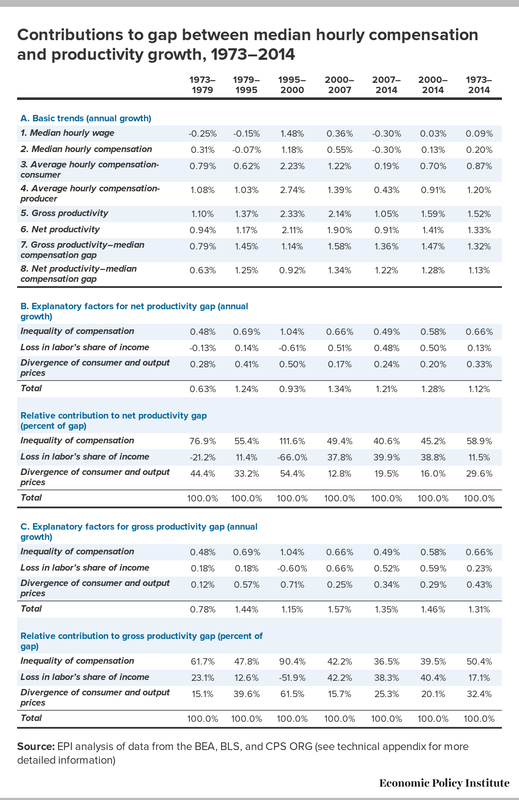 Finally, if we were trying to mislead about the sources of the wedge between typical workers’ pay and productivity with our presentation, we probably wouldn’t have included tables that precisely decompose these sources, and also provide this figure.